The cottage can sleep up to six guests. the main bedroom has a queen-size bed and dressing table. The second bedroom has two single beds and a king-size bed, which can be separated as another two single beds. The cottage has a large sparkling clean bathroom with a shower. 70s GUEST ROOM Sleeps 2 Includes: Room Only QUEENBED WITH EN-SUITE SHOWERED BATHROOM.GREAT FOR OVERNIGHTING AND COUPLES.COFFEE STATION AND FLATSCREEN WITH DSTV. GARDEN ROOM Sleeps 2 Includes: Room Only TWIN ROOM WITH BED AND KITCHENETTE. SHOWERED EN-SUITE BATHROOM. INDUSTRIAL STYLE HOME Sleeps 4 Includes: Self-catering MODERN STYLE HOME - FULLY EQUIPTEDPERFECT FOR LONG STAYS! Felt so welcomed and enjoyed the peaceful atmosphere. 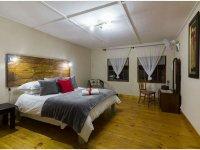 Meurant Self-Catering Cottage is 1.5km from the centre of Riversdale , the nearest airport 124.5km (George Airport).